For several years now the Taizé brothers living in Senegal have been working closely with Caritas, within the framework of the P.A.R.I. (a reception service for refugees and immigrants). Over recent months, the number of refugees they have welcomed has decreased significantly. The reason for this could be the present stability and absence of conflicts in the neighbouring countries. But what has become of all the “turned back-deported-clandestine-immigrants” who, from Spain and the North of Mauritania, are transported towards the frontiers, especially between Mali and Senegal? And what could the P.A.R.I. do for them? This was what lay behind the idea of a journey; making a journey in order to better understand what is at stake when people are turned back, to make contact with the principle associations and NGOs who care for those who are turned back, and to maintain contact with them. 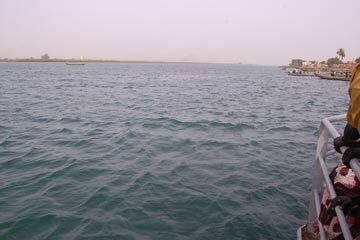 In order to do this, it would be necessary to retrace the different stages leading to Nouadhibou, in Mauritania, which is the departure point of the canoes and also the point of obligatory return for the migrants: Dakar – Saint Louis – Rosso (Senegal) – Richard Toll – Rosso (Mauritania) – Nouakchott – Nouadhibou. Our journey from Dakar to Saint Louis began on a beautiful Sunday morning. The road is dotted with big baobab trees and little villages with houses made from mud and straw. Sheep and cattle cross the road in complete liberty. On the right is the Senegal desert of Ferlo. Saint Louis welcomes us with the sunset. For two days, we are staying at the home of the Spiritan community, in the centre of Saint Louis Island, just opposite hundreds of multicoloured canoes. We set off to visit the Saint Louis Caritas. Their work consists in increasing awareness among the rural communities of the dangers of clandestine immigration; they also try to help the people to work together to find solutions in the villages so as to find means of survival on the spot. We are very keen to understand why the young people insist so much on leaving Saint Louis for Europe. Is the city doing anything for them? We can see the vast resources to be exploited here on the land and in the sea, but the young people seem to be captivated by some kind of “beyond”. A woman in the centre of town seems to have some answers as well as a special sort of contact with them. Madame Thioune has worked for a long time in an office of the administration called “Saint Louis Youth Space”. If you are looking for a sign of hope in all this business of young people leaving in canoes, Madame Thioune radiates a light that attracts many young people because she knows how to listen to them. She made us wait for an hour in the anteroom of her office because the young people are queuing up to speak with her. She shares a very sad story about canoe ferrymen from her own family. Someone from her family was involved in this clandestine traffic. It marked her so much that she made up her mind to fight against it in an intelligent way. She claims to have listened to young people who appear to be inhabited by a kind of diabolical evil spirit which pushes them to risk their lives on the sea, young people who have failed once but who insist on trying the crossing to Europe once again … This has nourished her certainty that she has to work hard to give hope again to these young people who are more and more fixed on an illusory paradise in Europe. At the Red Cross at Richard Toll, we find Mamadou Dia, the president for the Senegal River region. He listens to us carefully and finds interesting the idea of giving the P.A.R.I. address to people who have been sent home and whom they themselves are having transported to Dakar. In this way, what they are doing to assist people can in some cases be followed up by us. Once they reach Senegal, the young people are free. The Red Cross helps them very briefly: a shower, a meal and very quickly those who wish are taken by bus to the different regions of the country. 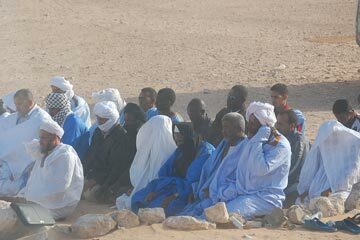 When we arrive at Rosso, in Mauritania, we knock at the door of the Spiritans who once again welcome us with open arms. Their mission guards the first church in Mauritania. There are only five churches in the whole country. They celebrated last Easter with thirteen Christians. One of the Spiritans who is going from Dakar to Atar offers to take us in his 4x4 to Nouakshott. From Rosso to Nouakshott the countryside Is far from being repetitive. The ground changes colour, with a different kind of sand every 20 kms. The vegetation is austere. On the right and the left, you can see dozens of small and larger tents set up along the edge of the way. There are also very small villages, with their brown houses with bright green windows, beautiful mosques and camels that cross the road quite freely. The austerity of Nouakchott surprises us. It is the lack of colour in the streets and the garments that strikes us right away. In the urban chaos and the traffic, people drive for the most part instinctively. Sand everywhere and dust in the atmosphere makes life difficult. People protect themselves all the time with their turban. Nouakchott sees its poverty increasing and the shanty towns spread gradually further. Part of the city is below sea level. There is a complete lack of salt free water. This has to be brought from a source sixty kilometres away. We are to stay some days at the Catholic Mission. 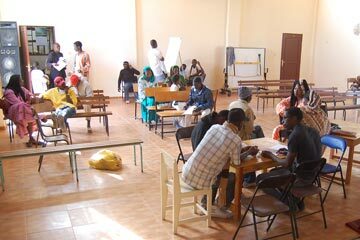 The mission is for foreigners since Mauritanians are officially 100% Muslim. But, as they emphasise, the Koran itself prescribes tolerance. 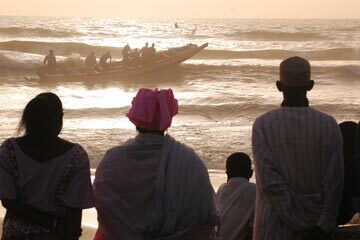 The mission welcomes Westerners and above all Africans who come for the most part from the Gulf of Guinea. In this immense country there are only four or five thousand Christians, twelve priests and thirty-five religious sisters. The days in Nouakchott are a real marathon. The numerous Christian communities that gravitate around the parish give us an idea of the great role that the Church plays among the population. Activities geared towards the most disadvantaged are the priority. Two sisters of Bethany and two French women from the parish welcome the immigrants. We are surprised to discover that they are doing exactly what we are doing at the P.A.R.I. in Dakar! The journey to Nouadhibou goes well; 500 kilometres of sand, on a well surfaced road, in a straight line to the North, with hardly any bends. 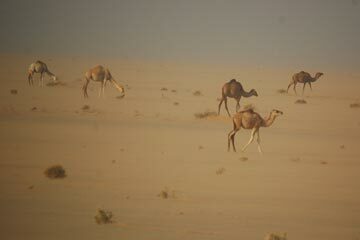 The wind is blowing hard and the camels gather together in the middle of “nothing”. After 250 kilometres, the Total station appears: a restaurant, a mosque, a supermarket and only ten minutes in which to do everything. The bus sounds its horn: we’re off again! At Nouadhibou, it is in the parish that migrants are welcomed in a very special way, thanks to the Nigerian charisma of Father Jerome. For several years, the influx of migrants passing through the parish has aroused and revitalised the community. Many young people are involved in caring for the migrants through very practical activities: microcredit, legal advice bureau, prison visiting, cultural programs, training programs, women’s groups, a dispensary, hospital visiting, buying medicines, health care awareness, learning to read and write, language courses, information technology, cooking, nursery school, library, funerals and so on. In this way, migrants arriving in Nouadhibou with different motivations discover in the parish that first of all they are listened to. Thereafter it is up to them to enter into an activity that will better enable them to become part of their surroundings. Among other places, we visited the Red Cross and the Red Crescent where they explained the situation that confronts them every time Spain or the maritime police intercept a canoe. They too agree to send us lists of people to be repatriated to the Red Cross at Rosso. It is here at Nouadhibou, just a few kilometres from the frontier with Morocco, that the focal point for the departure of the canoes is to be found at the present time. The town is a real crossroads for migrants; those who are looking for work so as to settle there, those who are simply passing through, those who are looking for a shuttle service to the Canary Islands, and those who hang around not really knowing what to do. From Mauritania, we came back tired out after this very demanding journey. Now, links have been established with several organisations and we hope that we shall soon be welcoming refugees once again at the P.A.R.I. in Dakar.